But what we ARE doing is selling the four uniform replicas we made for our women's TNG jumpsuit sewing pattern (and corresponding sewing tutorial)! 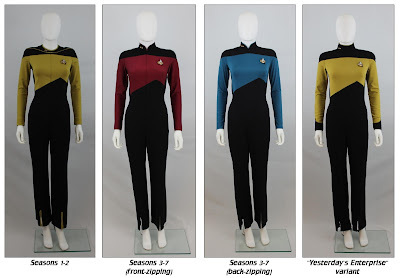 These TNG jumpsuits are great for cosplaying, but they also make impressive display pieces, too! They were made to fit a woman approximately 5' 8" tall, with a 32" bust, 25" waist, and 35" hips. Being made of spandex, they have a degree of stretch, and you or your local tailor can adjust them to better fit your physique if need be. This is a one-time-only kind of thing, and we're only selling four of them, so grab one while you can! The reason we're selling them is simple: we're always making new costumes and have many more patterns in the queue, but we simply don't have enough storage space or interest in cosplaying all of them. We'd rather these costumes go to owners who can appreciate and enjoy them! The first three TNG jumpsuits are listed in the "Ready to ship" section of our (Bad Wolf Costumes) Etsy shop. The fourth and final (teal) TNG jumpsuit will be listed soon; I just need to grab some quick video footage of it before letting it go. This is a great chance to grab a high-quality uniform replica at a huge discount! 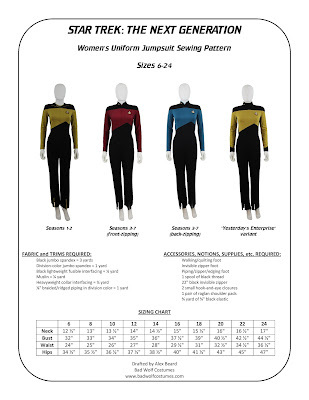 Our women's TNG jumpsuit pattern is now shipping! Thank you, everyone who pre-ordered! Our men's TNG jumpsuit pattern is hot on its heels! Also, FREE sewing tutorial coming very soon (hopefully in the next few days)! 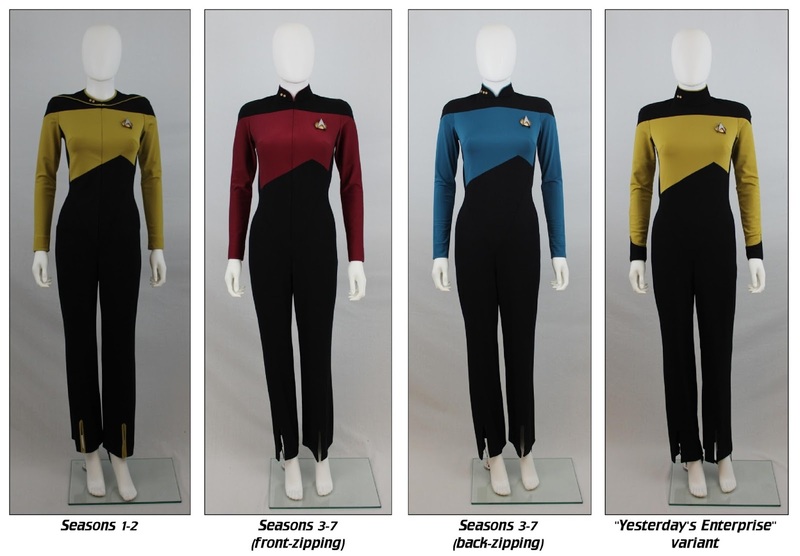 Subscribe to our "Costume Guide" e-mail newsletter (on the Star Trek Costume Guide) for updates!